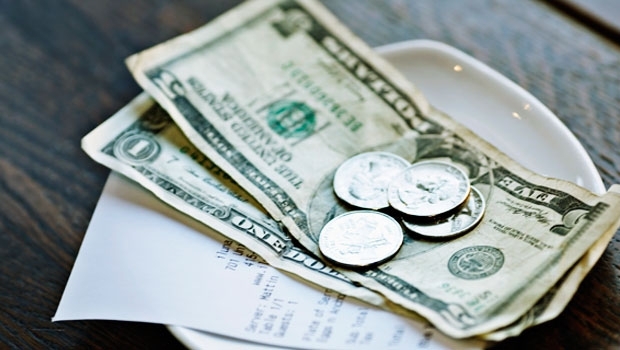 (P1) Recently, Danny Meyer, founder of the Shake Shack restaurant chain, announced that his restaurants will DO AWAY WITH tipping. He plans to pay his staff higher WAGES and pass the cost to customers by raising prices on menus. Is this a good idea? We invited food writers, restaurateurs and other experts to WEIGH IN. (P3) One night years ago in Amsterdam, some friends and I had an EPIC dinner — creative food and excellent wine, served by a smart, enthusiastic woman. When the bill came, we knew tipping wasn’t the norm in the Netherlands, but we felt COMPELLED to leave something, to show our appreciation. When our server saw the extra cash, she looked IRRITATED, even hurt. “What is this?” she said, throwing it back on the table. (P4) “We’re American,” STAMMERED my friend. (P5) “That’s the only way we have of showing you we like you,” I added. (P6) Which is sad, when you think about it. I’ve worked in restaurants and bars in the U.S. and abroad, but I’ve never loved tipping. I tip LIKE CRAZY, but I also feel OBLIGED to be nice to waiters and waitresses. It’s a MUTUAL effort — isn’t dinner better when everyone is happy to be there, well-paid and well-fed? (P7) Tipping is part of a larger problem of price transparency in America. We’re encouraged to consume based on price alone, disregarding labor and other costs. Yet the price we see is not the price we pay, because it does not include sales tax and tips. In some other countries, the price you see includes all those costs. (P8) Danny Meyers’s proposal to eliminate tipping at his restaurants is a small step in the right direction. More importantly, he’ll be paying servers a RESPECTABLE wage and raising menu prices to reflect that. The only problem is I’ll have to find another way to tell waiters how great they are. But I guess I could talk to them! Is tipping the norm in your country, or not? How many times per week do you usually EAT OUT? Have you ever worked as a waiter or bartender, or any other job where you offered direct service to the public? Was it pleasant or unpleasant? Have you ever traveled to another country and been confused by some of the customs, such as tipping or no tipping?